Votes are being counted in the election of West Yorkshire’s police and crime commissioner. The result will be announced today after people were asked to choose candidates at the same time as the local elections yesterday. Mark Burns-Williamson was elected as West Yorkshire’s first police and crime commissioner (PCC) in 2012 after the role was introduced to replace police authorities. PCCs are in charge of the local policing budget and responsbile for holding chief constables to account. 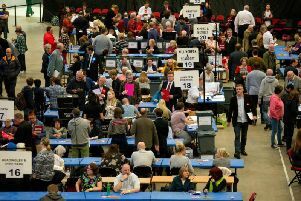 The winner of this year’s the West Yorkshire PCC election will be announced at Wakefield’s Thornes Park Stadium later today after first and second preference votes are counted. Mr Burns-Williamson won in 2012 with just under 48 per cent of the vote after a turnout of just 13.3 per cent. The average turnout this time round for West Yorkshire local authorities was 34.7 per cent. It was lowest in Wakefield, where 29.79 per cent of eligible voters took part in the PCC election.